LinkedIn's revenue growth is now much higher than it was when Microsoft bought the company. By just about any measure, Microsoft's (MSFT - Get Report) $26.2 billion purchase of LinkedIn is looking pretty good right now. The software giant's June quarter earnings report provides fresh proof. Microsoft disclosed LinkedIn's revenue rose 37% annually for the second quarter in a row, and totaled $1.46 billion. For comparison, LinkedIn's revenue grew 23% in its last full quarter before it was acquired (Q3 2016). Record job-posting activity by business clients was reported, as was a 41% increase in user sessions; that's better than a March quarter level of "over 30%." Microsoft also disclosed that LinkedIn now has over 575 million registered members, up from 467 million in September 2016. Not all of these members are active users, but the professional user data that collectively provided by their profiles has tremendous value for both LinkedIn's business as well as other parts of Microsoft's empire. LinkedIn's bottom line, which was pressured last year as Microsoft stepped up its investments in the company, has been improving as well. 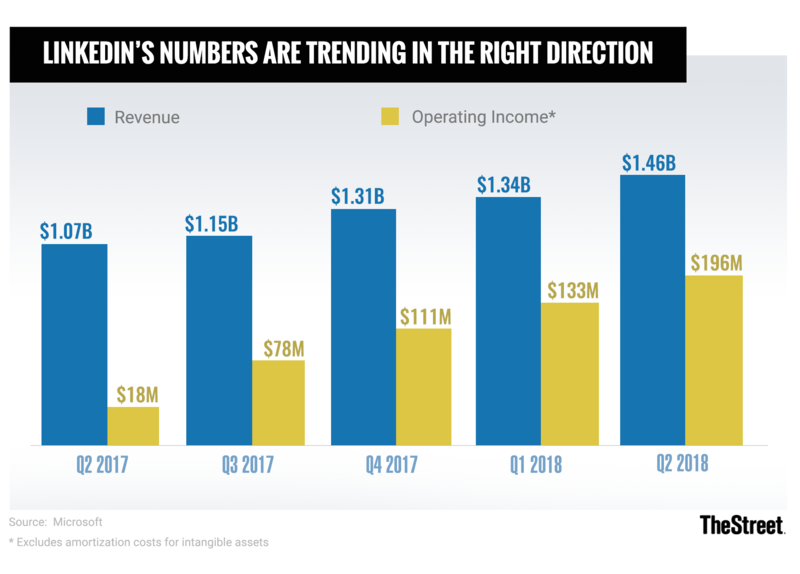 Excluding amortization costs related to intangible assets, LinkedIn's operating income rose to $196 million from $133 million in the March quarter and just $18 million a year earlier. What's been driving LinkedIn's growth? As Microsoft CFO Amy Hood mentioned on the earnings call, it hasn't hurt that the U.S. jobs market has been pretty strong; prior to the closing of the Microsoft deal in late 2016, close to two-thirds of LinkedIn's revenue came from its Talent Solutions segment, which provides software and services for companies looking to use LinkedIn to recruit workers. And though one can argue can more work still needs to be done here, LinkedIn has been taking steps to overhaul its user experience (frequently criticized over the years) since being acquired, in part to make it a place that more of its registered members use it for something besides job-searching. Among other things, LinkedIn has revamped its messaging experience under Microsoft's oversight, and has tried to create more of a Facebook-like news feed experience in which users see a mixture of content from professional connections and followed public accounts. Higher user engagement directly benefits LinkedIn by boosting its news feed ad revenue and driving subscriptions for LinkedIn Premium and LinkedIn Learning. And indirectly, it provides a lift to Talent Solutions by providing a larger base of workers who might potentially see a company's job posting. Made it possible to tie LinkedIn account info with Microsoft's Azure Active Directory (Azure AD) service for managing the identities of corporate workers, so that Microsoft apps and services used by companies relying on Azure AD can show info from a worker's LinkedIn profile when it's relevant. Integrated LinkedIn profile info and photos with Office 365's profile cards, which appear in Outlook and other apps. Integrated its Dynamics 365 for Sales app with LinkedIn's Sales Navigator tool for selling to LinkedIn users. Data pulled from LinkedIn is used to help recommend actions to salespeople relying on Dynamics 365, as well as to connect with and get information about potential buyers. More moves are likely on the way. Microsoft has said it wants to fully link its giant Microsoft Graph programming interface (API), which can be used by both Microsoft and third-party apps to search for or surface a variety of data (e-mails, messages, files, contact info, Excel data, etc.) with LinkedIn's professional data graph. It also wants to create a professional news feed for Windows users that fuses LinkedIn feed content with things such as business news and content from Office 365 apps, and to create analytics tools for better understanding employees and business trends. While there are plenty of differences between the companies, Microsoft's success to date with LinkedIn bodes well for its pending $7.5 billion purchase of code-sharing/hosting platform GitHub. As it has done with LinkedIn, Microsoft plans to have GitHub retain a fair amount of independence, while looking for ways to promote its offerings to GitHub's user base and leverage its services to enhance other Microsoft offerings. Notably, Microsoft's shares ticked higher after the GitHub deal was announced, in spite of its steep price. That says a lot about how much more confident Wall Street now is in M&A execution skills of a company that has taken some giant write-downs on deals in the past. LinkedIn's performance to date undoubtedly has had a lot to do with that change of heart.